Born in 1759 in Kirkcubright, Scotland, Robert Lenox arrived in New York City at the end of the Revolutionary War. In 1783 he married Rachel Carmer and the couple had six children—only one of which was a son. Lenox amassed a comfortable fortune in the East India trade and in 1818 paid $6,920 for thirty acres of land far to the north of the city where wealthy New Yorkers still maintained large summer estates. Called the Lenox Farm throughout the 19th century, it would eventually be known as the Lenox Hill neighborhood of the Upper East Side. The nearly $7,000 that Lenox paid was a staggering amount and Lenox knew he had overpaid for the land. But he also predicted the eventual value of the property as the growing city spread northward. In his will dated May 23, 1829, he cautioned his son to hold on to the potentially-profitable land. Upon his father’s death in 1839, James Lenox became one of the wealthiest men in the city. At 39 years old, he took over the family business for six years, then retired in 1845 to concentrate on his true love—collecting and studying. 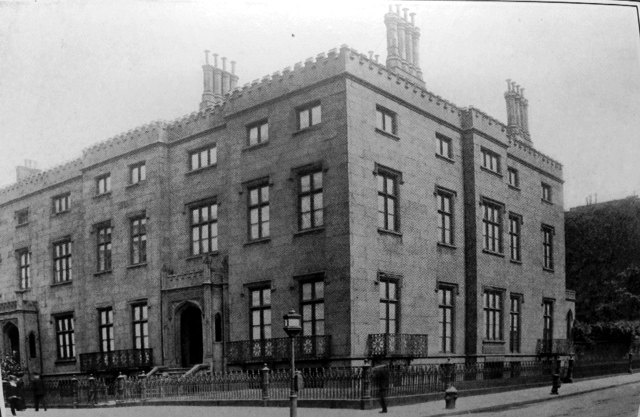 Almost immediately following his father’s death, Lenox began construction of a pair of impressive mansions at the northeast corner of Fifth Avenue and 12th Street. Development of Fifth Avenue had begun only a few years earlier when Henry Brevoort completed his handsome brownstone mansion in 1834. The Lenox mansions would diminish the Brevoort house. The paired homes stretched 131 feet up the avenue—the width of at least four normal-sized building lots—and 150 feet along 12th Street. James would live in the massive corner house, his sister Henrietta in the significantly smaller—albeit expansive—adjoining mansion. The brownstone structures were designed in the currently-popular Gothic Revival style; taking the motif to the point of romantic crenellation along the roofline. Ornate Gothic-style iron fencing enclosed the surrounding yards. Lenox’s influence led to the immediate Fifth Avenue neighborhood's becoming a family enclave. The blocks around Henrietta’s and James’ mansions filled with the lavish homes of the Maitlands, Kennedys and Banks families—all related by marriage to the Lenoxes. Before his mansion was completed Lenox had already begun his collecting. He traveled throughout Europe amassing a broad variety of books, artwork and artifacts. But he became increasingly private, filling his house with his collection and neurotically guarding his treasures against the outside world. 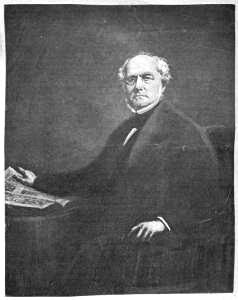 In 1845 he began a long-lasting relationship with Englishman Henry Stevens who would act as Lenox’s book purchasing agent. It was not until 1847 that the two would meet and Stevens remembered that visit well. Stevens’ acquaintances were excited that someone was being given access to the mansion. “Now we shall hear and know something of Mr. Lenox, his library, and new house,” they told him. Even after the pair had established a close relationship Lenox remained detached. On November 25, 1868 he wrote to Stevens offering a 15-minute window in which to meet. Lenox’s collection went far beyond his library, which contained the first copy of a Guttenberg Bible in America, all the known editions of Milton’s “Areopagitica” and “Paradise Lost,” and first editions of Shakespeare’s plays. His walls were hung with uncounted numbers of oil paintings, sketches and etchings. In 1848 Lenox outbid the Congress Library for George Washington’s Farewell Address. He paid $2,200 for the manuscript (about $50,000 today) and considered it one of his greatest treasures. In the meantime, while Henry Stevens was scouring the world for rare books and Lenox was amassing an enormous art collection, the millionaire spent freely on philanthropic causes. A pious Presbyterian, he was famous for his devout morality and willingness to spread his wealth to worthwhile causes. While he held on to the Lenox Farm as his father wished, he donated parts of it for the establishment of the Presbyterian Hospital and the Presbyterian Home for Aged Women. Family members urged him to name the hospital for which he paid "The Lenox Hospital," but he steadfastly refused. He eschewed notoriety as passionately as some millionaires sought it. And although he gained the reputation of a recluse, he was social among his small circle of intimate friends, most of whom were relatives. But now, the newspaper announced, James Lenox had decided to make a “gift to the people of this city.” The collection had successfully overwhelmed the Fifth Avenue mansion and now, Lenox felt, was the time to make it public. He donated Lenox Farm land, the blockfront on Fifth Avenue from 70th to 71st Street for a library, along with $300,000—two-thirds of which was to be spent on erecting the building and the remainder to defray the expense of maintaining and operating the library. The Lenox Library, designed by Richard Morris Hunt, was as much museum as library; housing Assyrian antiquities and paintings by Constable, Gainsborough, Reynolds, Turner and Raeburn alongside American works by Frederick Church, Cole, Morse, Copley and Inman. The funeral took place in the mansion at noon on February 21 during a raging snowstorm. The New York Times reported “The last request of the late James Lenox—that his funeral should be strictly private, attended only by his relatives and most intimate friends—was so carefully respected that less than a score and a half of persons were gathered in the plain, old-fashioned brown-stone dwelling at Fifth-avenue and Twelfth-street.” Only two of the mourners, his doctor and his pastor, were not relatives. The bachelor millionaire left nearly his entire estate to his unmarried sister Henrietta. By the time of his death he had donated over $3 million to charitable causes. His massive mansion would sit vacant until Henrietta’s death six years later on July 6, 1886. Her immense estate, valued at around $10 million, was divided among the many relatives. In 1894, after receiving a large bequest from a wealthy church member, the Presbyterian Church erected the large Presbyterian Building at No. 156 Fifth Avenue. The former Lenox mansion was now somewhat of a white elephant. After three years of arguing, the General Assembly decided to sell the house in 1897. “When the Lenox mansion, at 53 Fifth Avenue, was sold there were fears that this fine type of the spacious old-time New York residence would be torn down to make way for a modern structure,” said The New York Times. But it was purchased by nearby Fifth Avenue resident Thomas Fortune Ryan for the expressed purpose of preserving the neighborhood. The house with its nearly twenty rooms had old Italian marble fireplaces, spacious entry hall and staircase and frescoed ceilings. 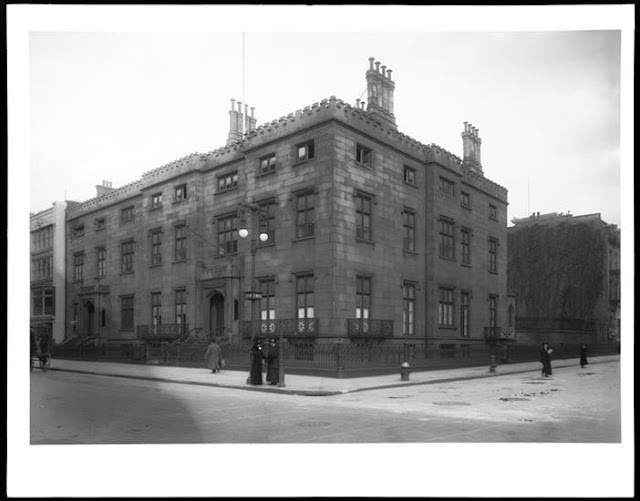 But it was in a serious state of disrepair by 1905 when the newly-formed Institute of Musical Art moved in. It cost the school $11,000 in repairs. The new organization which would eventually become the Julliard School attracted promising musicians from around the nation. 32-year old John G. McFadden came here in November 1906 from Oberlin, Ohio, where he had worked his way through college, focusing on vocal music. He entered a class taught by Prof. W. Klamroth and showed great talent; but suddenly developed a catarrhal infection that threatened his prospects of becoming a singer. Klamroth sent him to Dr. Percy E. D. Malcolm, who saw the young man once a month. McFadden refused to become a charity case so he scrimped on food in order to save money for his doctor bills. “He had grown thinner and thinner, his hair had turned to a grizzly gray, and Dr. Malcolm warned him more than once that he was not nurturing his body properly,” reported The New York Times. The Institute rented space to other organizations, the U.S. Aeronautical Reserve and the Washington Square Association among them. Then in 1910 it laid the cornerstone for a new, modern facility uptown. With the school gone Thomas Ryan gave up. “Mr. Ryan paid about $385,000 for the property,” said The Times on April 2, 1911, “and he bought other property in the neighborhood in an effort to prevent the encroachments of business. A little over a year ago Mr. Ryan felt that lower Fifth Avenue was doomed to become a commercial section, and he bought his new Fifth Avenue house, adjoining George Gould’s home at Sixty-seventh Street. The modern office building, designed by Maynicke & Franke, survives today and its footprint reveals the massive scale of the Lenox mansions that dominated the corner. Maybe a tiny typo here? Just a teeny typo! Thanks for catching that. scandalous-an assortment of voluptuous and oversize nudes by Bouguereau. Lenox collapsed of a heart attack and died.